When stocking an aquarium with fish, it’s usually recommended to choose one top dwelling species, one species that stays in the middle water layer and one bottom dwelling species to start with (unless the aquarium is < 15 gal/57L, then you should stick to only one or two fish species). In this article, we focus on the middle to upper water layers by discussing schooling fish! Keep reading for a list of easy but beautiful schooling fish that are peaceful, hardy and suitable for beginners without being boring. Harlequin rasboras are one of the more popular schooling fish, for good reason. They’ve been a favorite among fishkeepers for many years because of their hardiness, vibrant color and peaceful behavior and are actually on the list of best beginner fish. These little schooling fish don’t require a complicated aquarium setup. A rectangular tank of at least around 13 gallons/50L should be enough for a small group of 6-7, although bigger is better and allows for a larger group. Because harlequin Rasboras prefer soft, slightly acidic water they are most suitable for blackwater biotopes, although they can adapt to many different water conditions as long as the aquarium is properly cycled. You can add Indian almond leaves to darken the water and imitate their natural habitat. A few plants here and there will be much appreciated for the cover they offer. The Puntius/barb genus as a whole often gets skipped for community tanks due to the aggressiveness and nippy tendencies of the tiger barb. Pity, because there are many more types of barbs and not all of them are agressive. Cherry barbs (pictured at the top) are a great example. They’re beautiful, too: those intense oranges will brighten up any aquarium. Although they can occasionally nip at fish with longer fins, cherry barbs are actually peaceful and prefer an aquarium with other peaceful species. A group of at least 8 is preferable, although a tight school will usually not be formed. Some sources report that an aquarium of at least 5 gallons/18L is suitable for cherry barbs, but this is definitely not the case. At least 18 gal/70L is a much better place to start, as these fish grow to a size of around 2 inch/5cm. 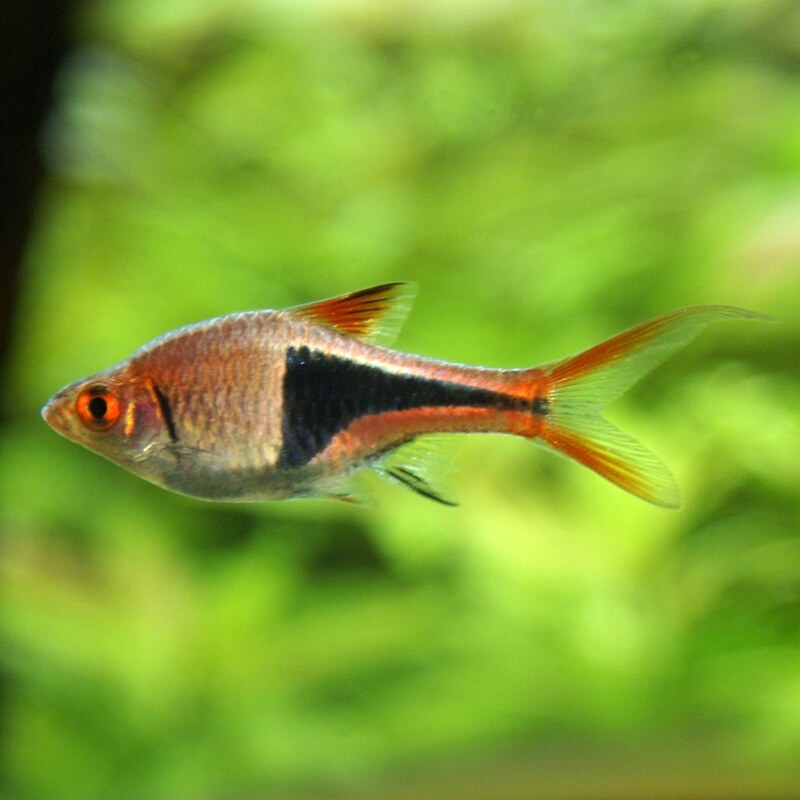 If you’re interested in keeping tetras but want something other than the super bright colors of your regular ol’ neon tetra for a change, the subtle silver and black of the black skirt tetra might appeal to you. Alternatively, you might like the very light colored white color variety that is referred to as the white skirt tetra instead. 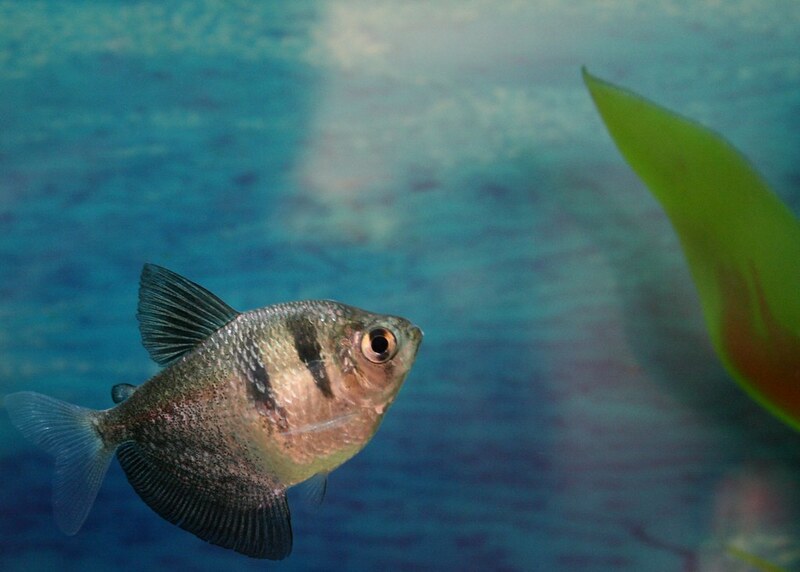 Black skirts (and white skirts) are one of the easiest tetra species and can be found in almost any aquarium store. They don’t demand specific water values, although they will appreciate it when the lighting is slightly subdued by floating plants and a dark substrate. An aquarium of at least around 20 gallons/80L is a good idea, as black skirt tetras are active and need plenty of swimming space. Tall live plants like Amazon sword are appreciated, but keep them limited to the edges of the tank! 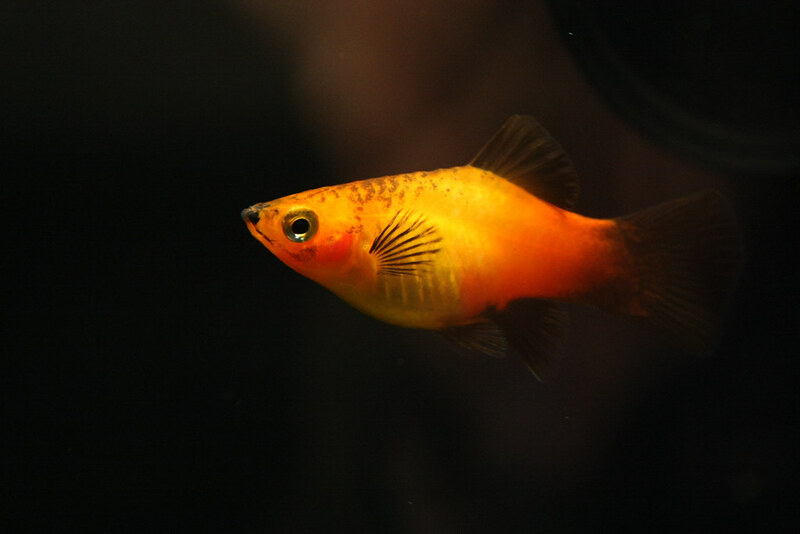 Closely related to swordtails, another long-time aquarium favorite, platies are one of the most popular fish in the aquarium hobby as a whole. They are livebearers that don’t require very specific care and are quite peaceful, which makes them suitable for most community aquariums. Like any other tropical fish, platies need a filtered, heated aquarium that’s large enough for a group of at least 6-7 fish. A planted tank around 20 gal/80L is a good place to start. Unlike many of the other fish on this list, this species doesn’t do very well in soft water. A pH of at least 7.5 will be more appreciated. Keep in mind that platies breed very quickly, so if you don’t have room for the fry it’s best to keep only males. If you do want to keep females, make sure you have at least two for every male as they will be chased relentlessly. To help the fry survive, you can add some Java moss as a hiding place. If you’re looking to set up an unheated aquarium, be sure to consider the ever-popular zebra Danio. This appropriately named striped species is a great choice for beginners due to its hardiness. In fact, it’s so hardy that it’s actually a popular species used in scientific research! This active species might be quite small at a maximum size of 2″/5 cm, but don’t think you can keep them in a small aquarium. They’re among the most active schooling fish and anything under around 20 gallons (75L, long) will interfere with their cheerful ways. Provide some cover in the form of plants, but be sure to keep them limited to the sides of the tank to keep plenty of swimming room. Don’t combine zebra Danios with docile fish: their activity level can stress out some of the calmer species. Additionally, long fins make an irresistible target for nipping. Want to know more about keeping zebra Danios? You can find a full caresheet on Aquariadise here. 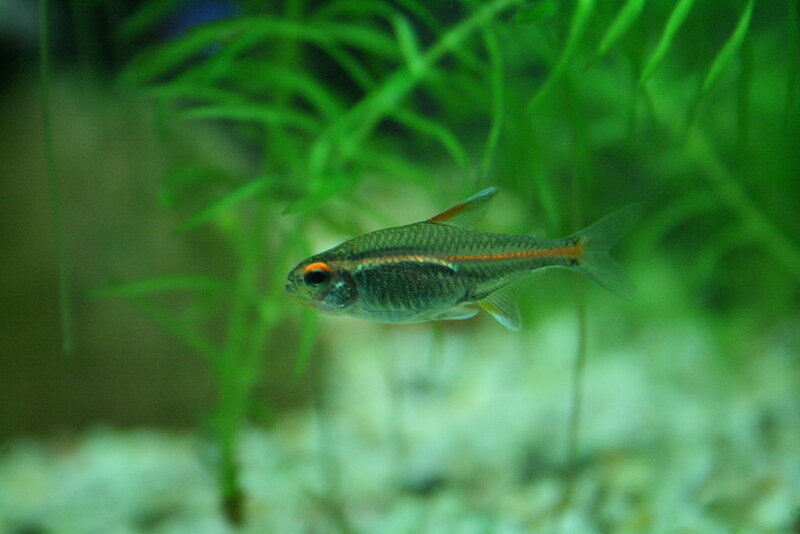 One of the most popular tetra species available, glowlight tetras are small silver fish with a red stripe along their body. An almost fully white albino version is also available but may be a little more difficult to find in aquarium stores. Like the other tetra species. discussed here, glowlight tetras prefer slightly acidic, heavily planted waters. A blackwater setup is actually the most natural choice for them, although they should do fairly well in any aquarium that offers plenty of cover. Their super peaceful nature makes glowlight tetras one of the best community fish and they will do well combined with most species that require similar water values. Other tetras are a good option and the ones discussed in this article can actually all be combined if your aquarium is large enough. Just be sure not to house your glowlights with any fish big enough to eat them! A setup of at least around 18 gal/70L should be enough to house a proper group of glowlight tetras. Yes, another tetra! Though a bit less well-known than the “classic” tetra species, bloodfin tetras definitely shouldn’t be forgotten when it comes to easy schooling fish. They are active swimmers that don’t require specific water values or temperature as long as regular maintenance is done. Definitely a fish that can brighten up any aquarium with their striking silver and red colors. Although like most tetras, bloodfins might try to have a nip at long-finned tankmates, they are mostly peaceful and do well in tropical planted community setups. Keeping a large enough school helps make them feel safe and can prevent most nipping behavior. A dark substrate and some floating plants are appreciated but not necessary. Do make sure to place at least some plants and other decorations in the aquarium to provide some cover. Like most other schooling fish on this list, white cloud mountain minnows are often the victim of improper care and housing. Some sources report that tanks as small as 2,5 gallons/9,5L(!) are suitable for one or two white clouds, but this is unfortunately a myth. Tanks of this size are not suitable for any fish, let alone an active schooling fish that needs to be kept in larger groups. An aquarium of at least 15 gal/57L is an absolute must. While they can withstand a wide range of temperatures, white clouds are best kept in an unheated aquarium (if the room temperature is unstable, use a heater set to 60-72 °F/15-22 °C to prevent stress). In the wild, they are found in densely planted mountain streams with soft, slightly acidic water. All this makes white clouds perfect for aquarists looking for something other than the regular tropical community. They do great in hillstream type setups with loaches and other species from similar waters. These fish are fun to keep and males will regularly display interesting breeding behavior, showing off their colorful fins to attract the females. Remember: when it comes to schooling fish, the larger the group the better they will look! While a group of 7 is enough for most of them, a group of at least 20 is a lot more spectacular and the fish will really appreciate the company. If you’re looking for a more extensive list of peaceful aquarium fish, check out 9 peaceful aquarium fish! For more beginner fish, see the list of best beginner fish. If you have any additional questions about these schooling fish or want to share your experiences, leave a comment below. Happy fishkeeping! 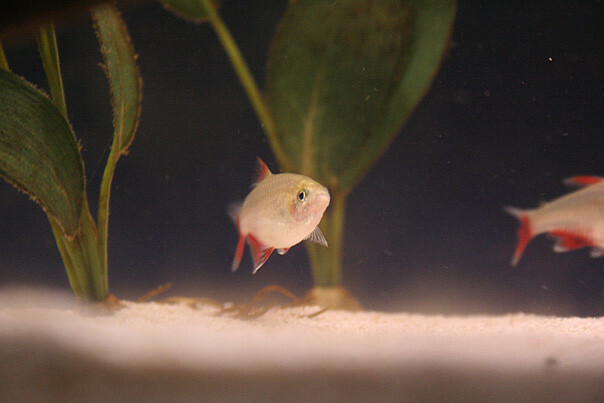 Hello, I’ve just rencently bought my White Skirt Tetras (two to be exact) and I was wondering if they have any different care methods than the Black Skirt Tetra mentioned in the article. If so, would you have any tips? Hello! White skirt tetras are a color variety of black skirts, so their care is the same 🙂 My only tip would be that as you can read in this article, these are schooling fish. They want some friends! Two is way too little for them to feel comfortable. First off, I recommend having a look at the articles on stocking an aquarium and aquarium stocking tips. Finding the right fish for your tank is much more complicated than just X fish per gallon unfortunately, there are actually endless factors to keep in mind. As for temperature, that will depend on the fish you end up choosing. If you look up care articles for them (which you should absolutely do before buying any fish), they will list the desired temperature. What about Danios? are those hardy? I’ve always wanted some =) will they be okay in a 15 gallon? Danios are certainly very hardy! 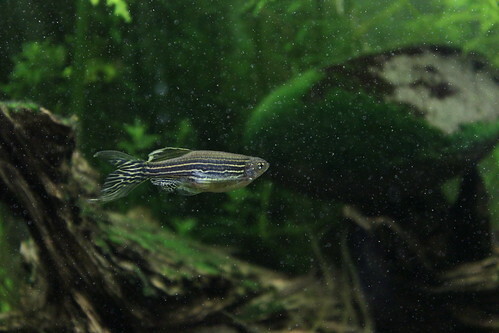 However, the most common zebra danios are super active swimmers and I think a 15 gal is a bit too small for them. A rectangular tank of at least 20 gallons or maybe even a bit more would be a better place to start. They also aren’t fully tropical and do best at around 64-74 F, which makes them a less than ideal match for many community tanks.